The Williams FW30 has fallen behind the pace of development this season, looking very promising at first but dropping behind such teams as Renault and Toyota as the halfway point approached. This decline continued at the British GP, Nico Rosberg starting from the pit lane after a poor qualifying session and Kazuki Nakajima managing only fifteenth on the grid. In the race, however, both drivers managed to finish, Nakajima in eighth after a couple of early off track excursions, Rosberg right behind him in spite of wiping off the nose of the car in an incident with Glock. As a result, Rosberg is coming in for some criticism and Nakajima's skills are receiving a good deal more attention. Realistically, the fortunes of both drivers have been affected by the performance of the car, however. Nico has looked increasingly desperate as the Williams fell back into the chasing pack and this has been the cause of so many of his ill-judged moves. It is a natural reaction to his hopes for this season being so cruelly dashed and I am sure that he will steady himself as time goes on. In this, he is at the same stage as Hamilton, having shown his talent last year and had expectations heaped upon his shoulders, only to find that fate does not always smile upon him. Nico should emerge the better driver for this season of adversity. As for Nakajima, he is continuing from where he left off in GP2, getting steadily quicker and staying out of trouble to be there at the end of races when the points are handed out. Never far from the pace of his team leader, and occasionally faster, he is a team manager's dream rookie, level-headed, eager to learn and just bursting with potential. Already his consistency puts him ahead of Takuma Sato as best Japanese driver yet and he may develop into a true contender for titles in time. So much depends on how the Williams performs for the rest of the season. Patrick Head has declared that they will be continuing development of the FW30, rather than concentrate on 2009 and I think this is the right thing to do. The team's drivers deserve to have a decent shot at the forthcoming races after all the pre-season optimism has faded - next year is an imponderable in which all teams will be struggling with the new rules. Just behing Rosberg in the finishing order came Mark Webber, the surprise of qualifying and the man who threw it all away in the wet. The Red Bull RB4 is proving to be BMW's closest challenger at the moment so it was particularly disappointing that both drivers fared so badly in the race, Coulthard even taking out Vettel in the similar STR3 on the first lap. Bourdais brought the other Toro Rosso home in eleventh but it was no compensation for the Red Bull teams after promising so much. Not all races will be wet, however, and we can expect RBR and STR to be in the points in future. I cannot see them winning at all but Webber, at least, should grab a podium finish or two. Which leaves only Force India. They had a terrible race at Silverstone, both cars failing to finish, but have looked a lot better in testing at Hockenheim. Their target has to be Honda and it looks possible, given that the Japanese team are putting all their effort into next year from now on. If Force India succeed, F1 will have no guaranteed tail ender team and I cannot remember a time when that was so. Best of luck to them, say I.
I thought what Williams said about their 2008 and 2009 car development was quite surprising. They obviously feel they've put too much (or enough) effort into their 2009 campaign, but halfway through this season, what do they have to gain by improving their 2008 car? It makes me wonder whether Williams have performance clauses for 2008 with their sponsors or perhaps even Nico Rosberg, and they're concerned hey aren't going to achieve them. I agree that the recent Williams statements are a bit unexpected. 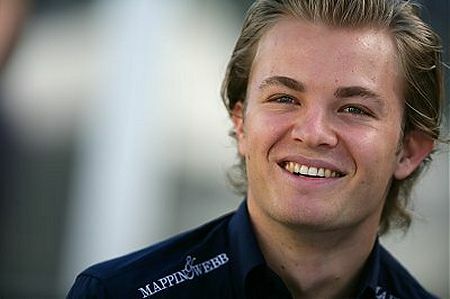 They gave me the impression that it was Rosberg who was pushing behind the scenes, more than anything else. He still has a high value on the market place and is the team's best asset as long as that remains so. He will not want to see his options limited by a poor season so I reckon it's likely he's using whatever influence he has with Frank and Patrick to put more into the current campaign. Judging from the comments on your half term assessment of the drivers, Keith, an improvement in Nico's fortunes cannot come too soon - it's incredible how quickly support for a driver can melt away.